My experience with balance has been, the older I get, the more that I am challenged with balance. When I make Nite Camps on a street, often the street is way out of being level. In these situations, I'm constantly correcting to keep from toppling over! Recently, I Nite Camped in a town whose streets had much bigger than average crowns. The gutters were way low! During my Nite Camp in this town, many times I would lean kinda uncontrolled into Scampy's lowest wall! I've been mulling over doing a simple leveling device. A bottle jack attached to an extension rod. Note: My balance has definitely improved because I do not let balance issues stop me! [ie: Keep doing stuff even though I may fall down occasionally] . On the back of the shower room door, is a really convenient and unused place to mount containers for things. Especially for things like kitchen utensils! Presently, there is a container there with hooks at the bottom. Those hooks hold my belts. I'm planning to move that container with my belts from the door to the rear shower wall. Today marks 76 years since the Japanese attacked Pearl Harbor on Sunday morning, December 7th, 1941. I was a 4-year old boy living in City Terrace [East Los Angeles]. I do not remember the beginning of World War II. I remember the ending though. "The war is over! The war is over!" 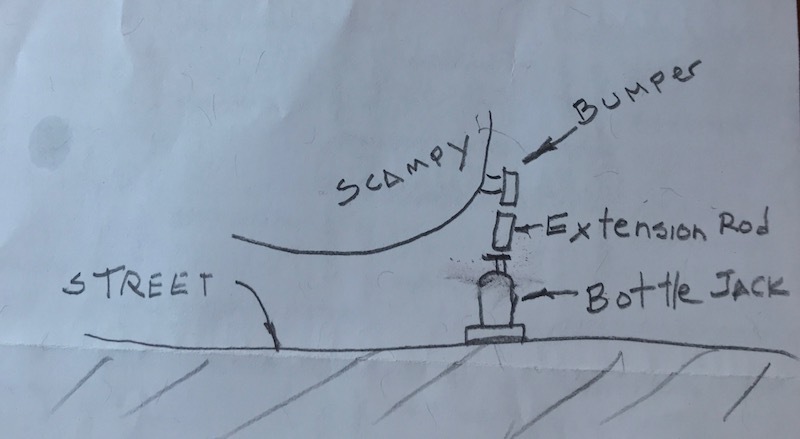 While John and I were talking about the leveling jack idea, he suggested that perhaps using the jack mounted on Scampy's tongue might help in doing a level job for us! raised 2". That 2" did a real good job in making things much more comfortable while inside Scampy. 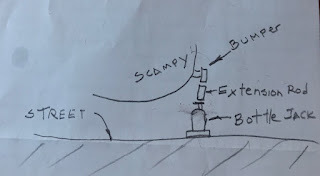 We still are investigating the bottle jack leveling idea. Because the tongue jack only raises Scampy up from the front. Sometimes we may need Scampy raised from the rear. Or from the side. The propane hose that trails out across the floor from your kitchen cabinet looks like an accident waiting to happen—especially if you trip on it when not level. We are in the middle of figuring out how to remedy that propane hose lying across the floor. Very observant of you! Good eye! 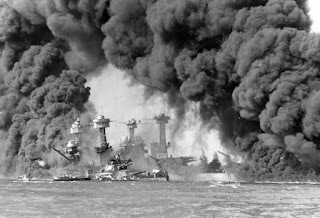 I have never felt the emotions of war more so than the day I went to the Pearl Harbor memorial. I was overwhelmed with emotions and cried looking at all those names on the wall...US flags waiving in the wind. I was 18 at the time. God bless those that gave their lives for our freedom. I am with you on that. I too have felt so very emotional at military parades and commemoration ceremonies. I have a class b and not a trailer but I like my plastic ramps. Light, quick and does the job. I would think you would only need one. Seems easier then jacks. Now that I am thinking about it, I believe that you are correct! It doesn't appear that you use your bathroom, as a bathroom, but more of a closet? I don't know if I could do without that convenience every night! I get a kick out of your labeling the toilet as a convenience. For me, that "convenience" is a necessity. Maybe a blessing! 24 Hour Fitness for showering. That room is my clothes closet. Also a utility room [Mop, broom, cleaning supplies]. Do I need a cable guard?! Live and learn. For leveling my Campervan, I use a set of leveling blocks from Walmart. They are lightweight plastic. They fit together like toy Lego's and you can stack them up to several inches. Simply place them in front of the wheel and drive up onto them. Make a reminder system so you don't drive away without them. Don't ask me how I know. Google image search "tongue jack" . Im fairly certain it would work for you. What's wrong with a couple of 2 x 6 pieces of lumber? and remember your refrigerator needs to be reasonably level to operate correctly..not being level on a regular basis is very bad for it and replacement RV refrigerators are NOT cheap. Hi George... re the trailer tongue jack...likely a possible solution. Just look at any boat trailer when someone launches a small boat at the ramp you recently described, re the free dump. You will see most trailers have a tongue jack. It will usually be sitting alongside tbe front part of the trailer that is hitched to their truck or suv. When the owner wants to remove the trailer from the truck they first spin the jack 90 degrees with the wheel just off the ground. 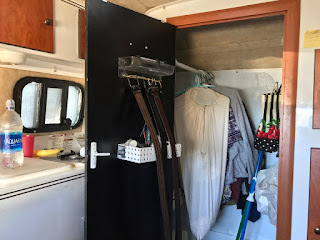 After taking their lock off and lifting the latch, they will turn the handle attached to the jack... which lifts the trailer off their hitch. The mentioned Camco leveler ramp is just one way to raise one side via the wheel. Check out the Anderson leveler (good for 2-3 inches of lift) and the BAL leveler (good for 4-5 inches, best on solid ground, and a good cordless drill motor makes it almost effortless. That Bal Leveler is perfect! I just Amazoned myself one of those! George,We travel in a Class C and do a lot of boondocking. If we are not level we move to a location where we are. Problem solved. No cost and no storage. Good luck. I really like your, Can Do way! I am doing mostly Street Camping. The streets are often tilted to make the gutters.